First off, lots of crossed fingers and toes for all of you who are currently being threatened by the current bush fire fronts out there. I am sending good vibes for the safety of you, your families and your homes! There's two new things happening with me at the moment - Vintage Grrl and I have have gotten onto the Bento Bandwagon. We are both quite taken with the idea of packing Bento lunches for ourselves and people in our lives. I'm hoping that it helps to improve both mine and the other half's diet as well as saving us some money. I shall have to report back after I start packing these things! Secondly, as if I didn't have enough artsy-crafty stuff to do.. 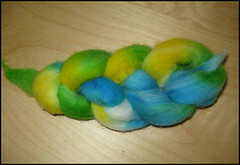 I've taken to dyeing roving! Here's "Tutti Frutti" - some Polwarth. I was pretty happy with the way it turned out. Can't wait to see that spun up.